I actually made these for the Christmas potluck party at my husband's work, cupcakes are so much easier than an actual cake for parties, no utensils involved. I love the way that the snowflakes look on the dark cupcakes. Originally I was going to brush them with some silver luster dust but I tried it on one and didn't like the look. It's an idea though for someone else who may like the way it comes out. I felt like the snow white appearance really brought out the winter season. 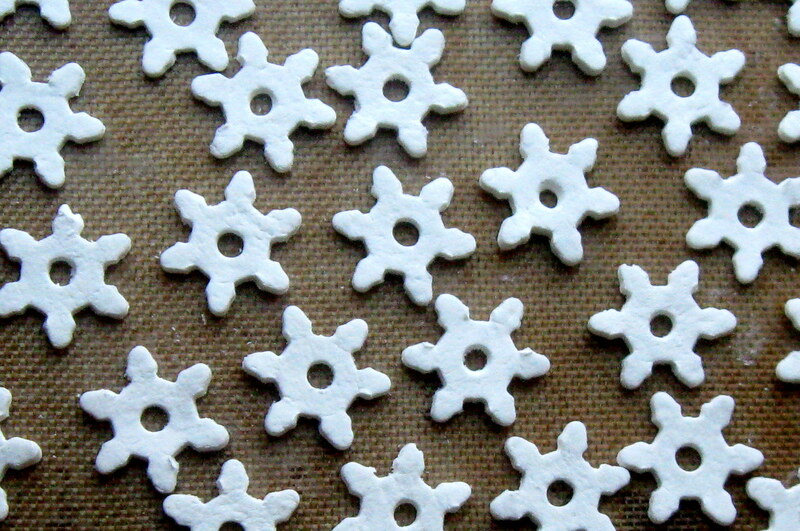 I used a small snowflake cookie cutter then poked a hole in the middle with a straw to complete the design. This is my favorite chocolate cake recipe and I've been using it for years. I use hot brewed coffee in the batter and it really brings out the chocolate flavor but you would never know that there was coffee in it. I'm sure you could also toss in some chocolate chips to the batter if you wanted to, but I would consider lightly tossing them in flour first to help them float a little better in the batter as it bakes (and not sink to the bottom). But really, would you be opposed to a cupcakes with melted chocolate at the bottom? I wouldn't turn it away :). 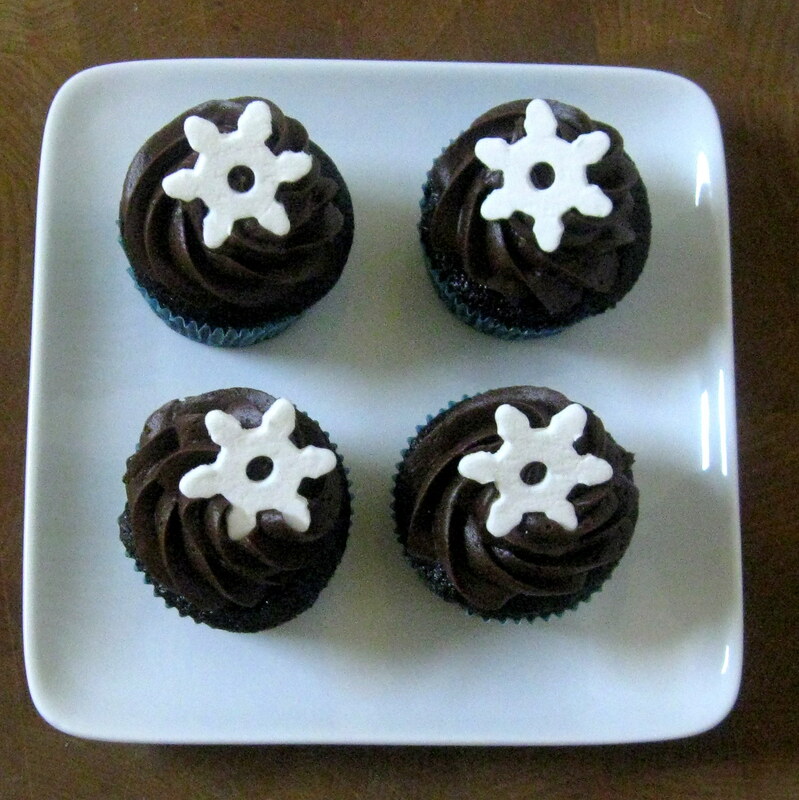 This cupcake recipe is actually really fast to but together, the snowflakes? they require a little preplanning because they need to sit for a few hours to harden. The dough for the snowflakes takes a little time but it's not difficult to work with and makes a lot of the decorations that can be saved. I've even read that the dough can be frozen, then thawed overnight in the refrigerator, and used in the morning for rolling out and cutting the decorations. I hope you love the cupcake recipe as much as I do! Happy Baking! 1. Preheat the oven to 350F. Line two 12-cup cupcake pans with cupcake liners, set aside. 2. In the bowl of a mixer combine the sugar and next five ingredients (through salt). Add the eggs and blend together. Add the milk, oil, and vanilla, then on medium speed mix for 2 minutes. Slowly add the hot coffee with the mixer on low speed until it is all added and the mixture is completely blended. The batter will be very thin. 3. Evenly distribute the batter between the cupcake liners, filling them about ⅘ full. 4. Bake the cupcakes 18-20 minutes or until a toothpick inserted in the center comes out clean. Cool slightly, then remove the cupcakes from pans and place on a wire rack to finish cooling. 1. Mix the butter with 2 cups of the powdered sugar, then add the rest of the sugar and the cocoa powder in ½ cup at a time until completely blended. The frosting will be extremely thick. 2. Slowly add the vanilla extract and the milk with the mixer on low speed. Once they are added in then scrape the bowl and turn the mixer up to medium speed. Mix on medium speed for 2 minutes until fluffy. 1. In a mixer bowl sift together the powdered sugar and cornstarch, then make a well in the center, set aside. 2. Mix together the water and cream of tartar in small saucepan, then sprinkle the gelatin evenly over the top. Let the pan sit undisturbed for several minutes or until the gelatin has dissolved. 3. Over medium heat let the gelatin mixture reach 150F without stirring. The mixture should have a clear appearance. 4. Pour the gelatin mixture into the well of the powdered sugar mixture and stir with the handle of a wooden spoon. If a regular spoon were to be used then the mixture may clump, which is why the thin handle is used. 5. Place the mixture on a mixer with a paddle attachment and blend for 1-2 minutes on low speed. Increase the speed to medium and blend for 3-4 minutes or until the mixture is very white and smooth. 6. Place the dough onto a piece of plastic wrap and wrap tightly, then let sit for 30 minutes to rest. Knead the dough, then roll out on a board lightly sprinkled with cornstarch to about ⅛” thick, then cut into desired shapes. Place the shapes on a cookie sheet and let sit for several hours until hardened. *Colored gels can be added to the mixture after resting but before it is kneaded, if desired. - This recipe is made with edible ingredients but is not intended for consumption.